With protectionism and the threat of a trade war between the United States and China looming large, strengthening cooperation with Southeast Asian countries could serve as an antidote to isolationist, illiberal tendencies engulfing the world, said a group of diplomats from the Association of Southeast Asian Nations during a visit to Korea last week. A delegation of ambassadors and permanent representatives of Southeast Asian governments to the ASEAN secretariat in Jakarta, Indonesia stressed that the regional organization had long parted ways with protectionist policies and had embraced free trade and multilateralism as a practical development strategy going forward. “Collectively speaking, we support free trade, adherence to the multilateral trading system: World Trade Organization. We don’t agree with unilateral actions and tariffs imposed by certain countries,” said Singapore’s permanent representative to ASEAN, Ambassador Tan Hung Seng, during a press conference organized by the ASEAN-Korea Center in Seoul on June 25. The ASEAN FTA is a trade bloc agreement supporting local manufacturing in all ASEAN countries, with commitments to eliminating tariffs and nontariff barriers within the bloc and promoting foreign investments. “These free trade arrangements will be good antidotes to a possible trade war,” he added. 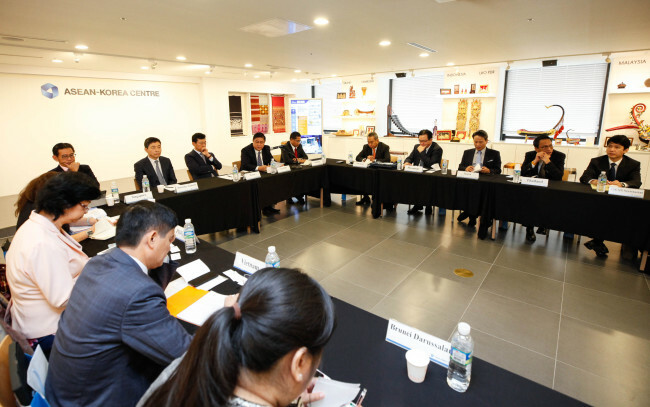 Tan, along with 10 other ASEAN diplomats and eight South Korean diplomats, participated in the forum to discuss the objectives, strategies and potential of Seoul’s New Southern Policy. The policy, unveiled by South Korean President Moon Jae-in during a visit to Indonesia in November, aims to bolster and elevate ties with Southeast Asia to the level of the four major powers of the US, China, Japan and Russia. The Philippines’ permanent representative to ASEAN, Ambassador Elizabeth P. Buensuceso, agreed. Unlike in previous decades, when the ASEAN bloc traded disproportionately with the world’s booming economies like Japan, Korea and India, explained Buensuceso, there is increasing intraregional trade taking place among the 10 member states -- Indonesia, Malaysia, the Philippines, Singapore, Thailand, Brunei, Cambodia, Laos, Myanmar and Vietnam -- in line with its Economic Blueprint 2025. 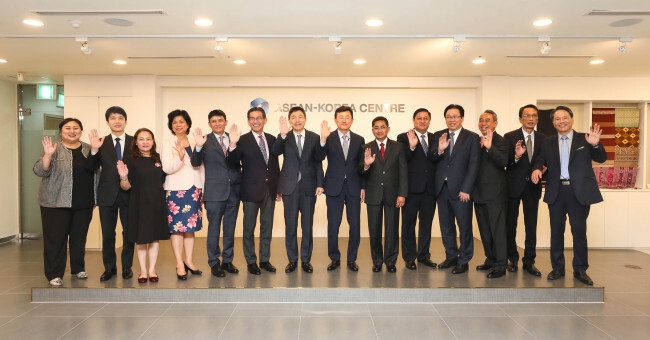 ASEAN-Korea Center Secretary-General Lee Hyuk said that the two sides have expanded cooperation not only in commerce, but also in cultural and people-to-people exchanges. Lee was South Korea’s ambassador to Vietnam and the Philippines, and has helmed the intergovernmental organization since April. The ASEAN bloc is the world’s sixth-largest economy with a combined gross domestic product of $2.6 trillion and growing population of 670 million people. Bilateral trade reached $150 billion last year, and the two sides are targeting annual trade of $200 billion by 2020. ASEAN is Korea’s second-largest trade partner and third-largest investment destination with $4.9 billion invested last year. Noting Korea is ASEAN’s fifth-largest trade partner and a key foreign investor, Laos’ permanent representative to ASEAN, Ekkaphab Phanthavong, said Korea had a key role to play in priority sectors such as transportation, energy, innovation and digital technology. “ASEAN and Korea can enhance their ties bilaterally as well as multilaterally through regional multilateral groups like the ASEAN Plus Three forum with China, Japan and Korea, ASEAN Regional Forum, East Asia Summit, ASEAN Defense Ministers’ Meeting as well as subregional cooperation initiatives such as the Greater Mekong Subregion Economic Cooperation Program,” said South Korean Deputy Minister for Political Affairs Yoon Soon-gu. Yoon noted that ASEAN has steadfastly supported Seoul in trying to denuclearize Pyongyang. The ASEAN member states, which have diplomatic ties with North Korea, could help the communist nation reform and develop, he affirmed. “ASEAN and Korea should strengthen cooperation to mitigate uncertainties in areas like the South China Sea,” the envoy said, adding the area has rich deposits of oil and natural gas and vital sea lanes for the global trade of goods and energy.